The apartment is in a renovated mid-century building, and features an open floor plan. 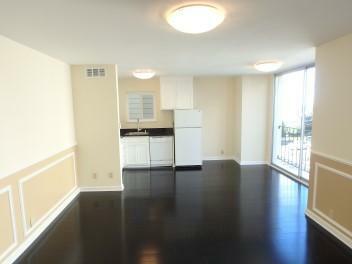 It has newer finishes and hardwood flooring throughout. The kitchen has a granite counter top, an electric oven and range, a refrigerator, a dishwasher, and an in-sink disposal. The bedroom has a walk-in closet, and the bathroom has a shower-over-tub. The location is highly desirable within pacific heights. It is within a short walk to great restaurants, shops, and cafes on Fillmore Street. Major transportation lines are nearby for easy access to the Financial District, Downtown, and other neighborhoods. There is easy access to the northbound 101 freeway. The building has an elevator and an on-site laundry facility. Waste disposal and water utility services are included. Minimum lease term of 12 months.